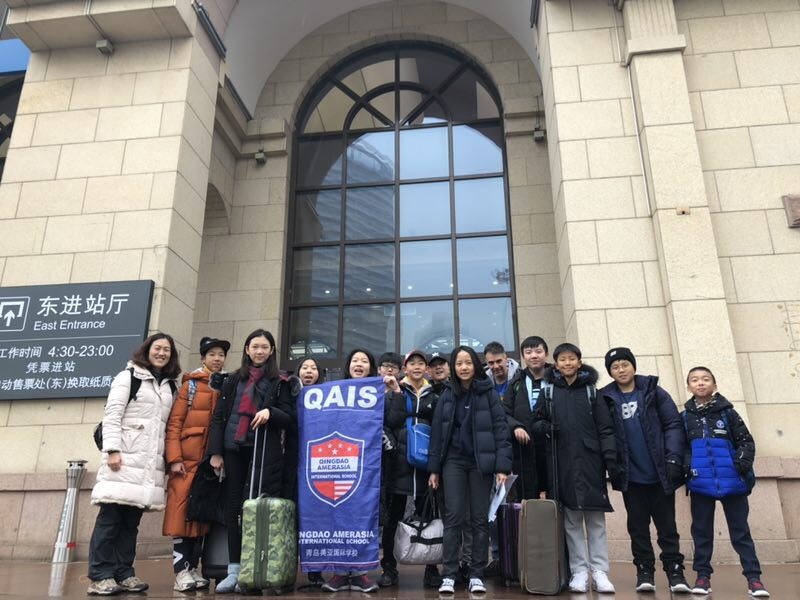 During the recent Christmas break, fifteen QAIS students sacrificed some of their holiday time in order to attend a math competition in Beijing representing a major step forward for the school in the area of competitive math. 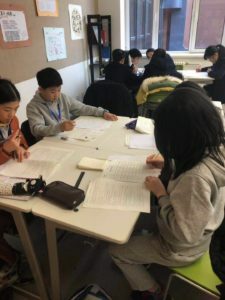 In November, QAIS dipped its toe into the waters of competitive math for the very first time in its history, when several dozen of our students participated in the “AMC 8” on our campus. AMC 8 (American Math Competition) is a one-hour individual test of challenging math problems, designed for students in Grade 8 or below. The trip during holiday in Beijing was an entirely different experience. 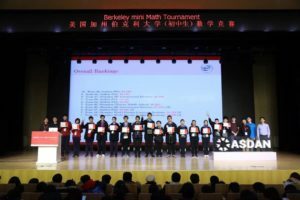 The Berkeley mini Math Tournament (BmMT), based in California, USA invited us to participate in their China tournament. Though we are a small school, they were hoping we would be able to send one team of five students. As it turns out, we sent three teams of students including a “junior” team comprised of PYP students. 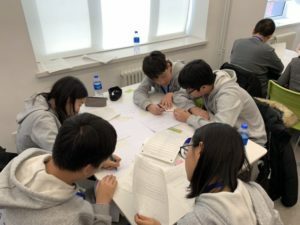 PYP students Jimmy Li, Justin Gong, Tom Ham, Kevin Wang and Aaron Gao joined upper school students Alex Wang, Wanda Yuan, Kevin Pak, David Sun, Julia Shang, Nina Yua, Jonathan Yue, Bena Chen, Fiona Guo and Mark Qin as participants in the BmMT. All of them showed tremendous initiative and enthusiasm for being willing to take time away from their holiday for a school event. And not just any school event … a 7-hour, brain-twisting day of difficulty. 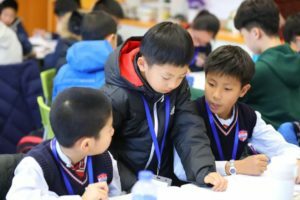 So what is the Berkeley mini Math Tournament and why did QAIS attend? The staff of Berkeley mini Math are essentially some of the smartest math people in the world. The organization is based out of the Silicon Valley area and is staffed by – excuse the term – Silicon-Valley ‘types’, frighteningly intelligent people … brilliant math minds. They spend a lot of their time creating devilishly complex math questions. Prior to the holiday, the QAIS math department held training sessions at QAIS, featuring BmMT questions. The math teachers (and the students) quickly realized how complex and challenging the questions were and how much of a leap forward this was from AMC. In fact, during the event, I asked a question during a Q and A session with one of the staff members, Professor Po-Shen Loh, a PhD in mathematics who teaches at Carnegie Mellon. My question was simple: “Why are these questions so hard?” Especially compared to AMC. His answer was that 100,000 students take the AMC tests … but only 1,000 participate in the BmMT. Thus, it is supposed to attract the most elite talent with appropriately-designed questions for such minds. He went on to say that it is challenging for the question-writers to not make them too hard. So why put our students through this “trture”? Answer: because it can be done. Our fifteen students were among a total group of 520 and within that amount were students that were getting near-perfect scores! How? Talent and Effort. These students have spent a lot of hours over the years practicing this type of challenging math, participating in events like this. It’s a skill not only to execute the math but to discover, within the context of the situation, the math that needs to be done. “Discovery” is a major factor in the success of a team. On this trip QAIS students had their own discoveries, not only within the different areas of mathematics that challenged them but also about themselves and their peers. They realized, maybe for the first time, that there is a world out there with elite math minds, people of their age. And I hope our students realize and appreciate that they are the elite math minds of QAIS. Seeing themselves in this light should give them more confidence to try challenging experiences, math or non-math related. So, hopefully, that theme of ‘discovery’ continues for them throughout their years at QAIS. Also, a word about China … one cannot go to Beijing without appreciating the enormity of the city and of the experience. Though our students have been there before, some many times, we all soaked in some of the wonder of Beijing. Furthermore, watching those hundreds of Chinese students, including ours, demonstrating their brainpower and willpower is symbolic of this great nation. Finally, one must not forget that much of what they were required to do at this event was reliant on their understanding of a non-native language. The ability of our students to do what they do – in second and third languages – is always an impressive thing to behold. The entire faculty at QAIS, not just the math department, should feel pride in what happened this weekend. You all give them the assistance that they need each day in acquiring and using language, which better allows them to express themselves in their areas of strength and passion. We are seeing it on display more and more these days at QAIS … in the Black Box theatre, at Make X in Guangzhou and now with the Berkeley math group in Beijing. Make-X Robot Competition 2k18 - "A great example of sportsmanship"